Home / Shopping for replacement windows / What’s In Your Windows? We are often asked about “window glass replacement cost”. Here are a few things that you need to know when shopping for glass. When you’re out shopping, keep in mind that the U-factor is a measure of heat loss. It tells you how much heat inside your home is literally going out the window. A lower number means less heat is escaping. The Solar Heat Gain Coefficient (SHGC) tells you how much heat from the sun is entering your home. A lower number means less heat is entering, and this is especially important in north Georgia where 75 percent of the days are sunny. According to REMODELING Magazine’s 2012-13 – a mid-range vinyl replacement windows cost should average $9,720. This is an average of replacing 10 windows in a typical home. We are often lower than the average number due to the fact that we don’t have a large amount of overhead. We pass the savings down to our customers for replacement windows. Glass refers to the individual panes while glazing refers to their arrangement. Much of the glass used to create energy efficient windows has a Low-E coating, which enhances their ability to reflect heat back into a room on a cold day and to keep heat outside when it’s hot. This metallic coating is transparent, yet it reduces energy loss by 30 to 50 percent while guarding against the infiltration of ultraviolet light, which can cause furnishings and art work to fade over time. The space between the between the two panes of glass can be filled with a harmless gas or combination of gasses to help insulate the unit. Commonly used gasses include Argon, Krypton, and Xenon, but certain window manufacturers use proprietary blends. 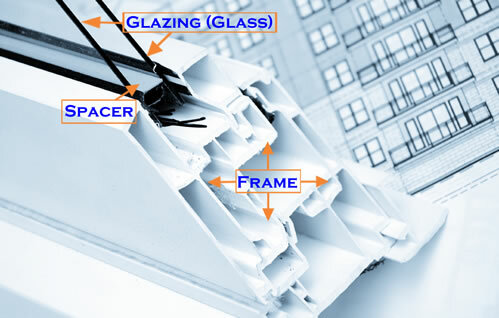 Spacers separate the panes of glass, maintaining the correct distance between the two while contributing to energy efficiency. Commonly-used warm edge spacers are made of steel, foam, fiberglass, or vinyl and help reduce heat flow while preventing condensation. Because they are located inside the unit, spacers affect the overall window performance rating based on their conductance — the measure of how a material takes on and transfers temperature. Finally, the glass, spacers, and harmless gas fills are assembled into the frame, which fits into the wall. Choosing a frame depends on several factors, including style preference, cost, and upkeep. Another factor to consider is the amount of stress the weight of the frame puts on your wall. Different frame materials affect the window’s overall rating performance differently. For example, vinyl frames are exceptionally energy efficient, fiberglass frames have low conductance, and wood frames provide great insulation while providing a traditional look that fits many home styles. The important thing to keep in mind is that regardless of how the components are assembled there is no “one best” window, but there are windows that are the best for you. The bottom line is how the window performs and whether it meets your goals and expectations. Tom Herron is the National Fenestration Rating Council’s senior manager.